You are currently browsing the Suburban Homesteading – Frugal Living blog archives for August, 2011. I consider unprocessed pickles, those made without water bath canning, a special treat of the summer growing season. When the garden or Farmer’s Markets are overflowing with cucumbers we make enough to enjoy from summer’s end well into fall, then like most homesteaders and gardeners, we start looking forward to the next growing season. It’s not that they go bad in the fridge, but they do lose that fresh crispiness that makes them a rite of the summer harvest. If you want pickles all year long, use a recipe that calls for water bath processing, so the jars will be vacuum sealed. 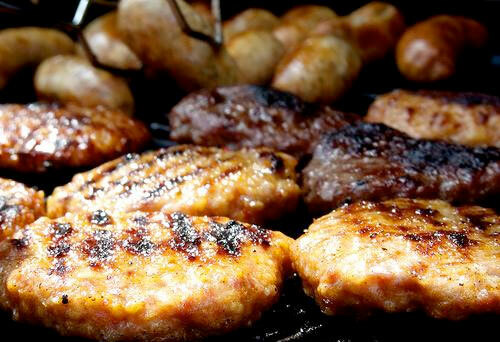 Our favorite recipe is from a retired railroad conductor. It was handed down from generation to generation and couldn’t be easier. The Jars: Thoroughly wash quart- size canning jars either by hand or in the dishwasher. The Brine: Determine about how many quarts of pickles you will be making. Boil one quart of water for each jar, plus a little extra for evaporation. Keep brine simmering. For each quart of water, add ¾ cup distilled white vinegar and 4 heaping tablespoons of kosher salt. 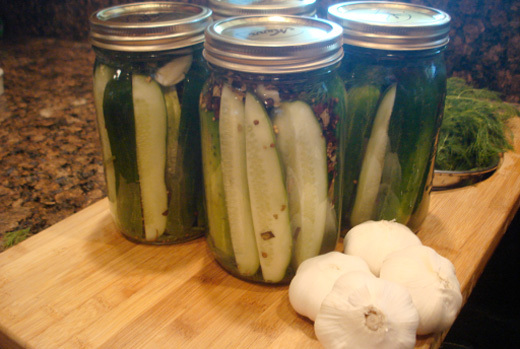 NOTE: Do not use reactive pots (like aluminum) for making brine, use stainless or glass for making pickles. Packing The Jars: Wash cukes. Cut or leave whole. Layer the bottom of each jar with fresh dill and crushed or whole garlic (3 or 4 cloves, more if you want a lot of garlic flavor). Pack cukes tight into jars. Seasoning The Pickles: To each jar, add 1 Tablespoon of pickling spice and a dash of crushed red pepper flakes, or 1-2 small hot red peppers slit open lengthwise (if you like), plus plenty of fresh dill flower heads (it makes a pretty presentation). Pour The Hot Brine: Cover everything with the simmering brine. Put Lids On. Leave jars at room temperature for two or three days then put in the fridge for at least a week before eating. Two weeks is even better, if you can wait that long. Storing Pickles: Pickles will keep for a couple months in the fridge. Of course, if you see anything funky going on in the jar you should not eat them. I was so disappointed when I found out that the California Mother Earth News Fair had been cancelled. According to MEN staff, there wasn’t enough interest in the fair to continue with its planning. I question that. I think California is in dire need of informative workshops and festivals on sustainable farming/gardening, self-sufficient and self-reliant living, and living a more simple less consumer intensive lifestyle. I mourned the loss of a few days spent with like-minded people that I could connect with and talk with and possibly build friendships with. But, my grief was short lived. Like a beacon in the dark. Like quenching a parched body, I found a wonderful (maybe even better) replacement – The National Heirloom Expo. Slated for September 13, 14 & 15 at the Sonoma County Fairgrounds, this event will include not only heirloom fruits and veggies, but a heritage livestock show as well. The schedule is chock full of speakers, workshops, vendors, heirloom displays, music and art, all there to help us learn to live a more authentic fulfilling life. What more could a farm girl ask for! As our friends and neighbors on the east coast batten down for hurricane Irene, we on the west are experiencing our own bizarre climate changes. Our pleasant temperate summer bolted into a heat wave yesterday, driving temperatures into the high 90s. What’s more, we are having a bout of humidity which is even more unusual than the cool weather, and light showers here and there. 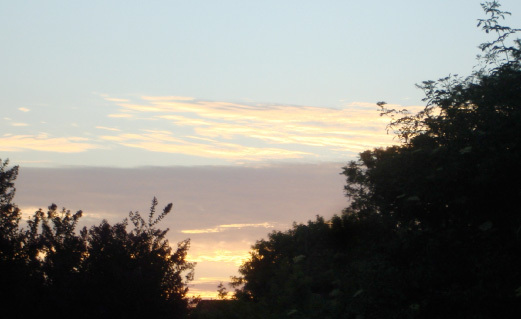 All this shifting and changing managed to produce a glorious sunrise this morning. I snapped this photo a little after 6am as I was strolling through the farm and feeding the chickens. I don’t think our cloudy weather has anything to do with tropical storms, but it did give me a glimpse into what my mid-west and eastern friends go through every day—muggy, sticky, sweaty. As I watched the news today, I can only pray that lives will be saved and damage will be minimal. Seems small and trite, but it’s all this homesteader has, being 3,000 miles away. Earth worms are an essential part of good gardening. At least in my mind they are. They are eating machines, transforming kitchen and garden scraps into nutrient rich soil and castings, while churning up the soil, aerating it and improving its tilth. 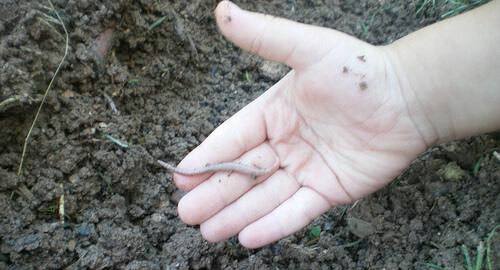 Raising your own earth worms is easy and inexpensive, if you use materials you already have on hand. Or, you can buy a worm bin system from a garden center or by mail. But, no matter how you come to raising earth worms you’ll never regret the initial work or cost and your garden will benefit greatly from the improved soil. I was lucky – the previous owners of my farm left a multi-tiered worm bin when they moved out. It sits in the shade near the barn with easy access to the garden and rabbit hutches, and is used all year round. The soil produced is a great addition to our raised beds, as long as I can keep the chickens from eating the worms. But, that’s another story. To build your own worm bin all you need is a container, either a wooden box, plastic storage bin or 5-gallon bucket. Any type of container should be about 18 to 20-inches deep, but no more than 24-inches deep. What a great way to spend a summer evening. “Heart & Soil”, a sustainable agriculture documentary will take you on a journey into the lives of southwest farmers, energetic farmer’s market and vibrant school lunch programs. The farmers are an inspiration for us all to dig more, grow more or to support those who do. A friend sent this to me. It was from an article in a San Francisco newspaper. Are people really this naive? 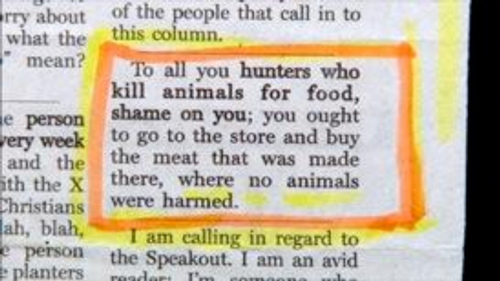 Do they honestly believe that meat in the grocery store did not come from a living creature? And, that the only processing of animal meat is done by hunters? If this is the case, I fear for the intelligence (or lack thereof) of the American people.